Ultra-Orthodox Jews rioted in Jerusalem on Monday in protest of the recent arrest of Shmuel Weisfish, a member of the haredi community's chastity squad who was allegedly involved in the torching of a store selling MP4 players in violation of a ruling of the Orthodox Court of Justice. 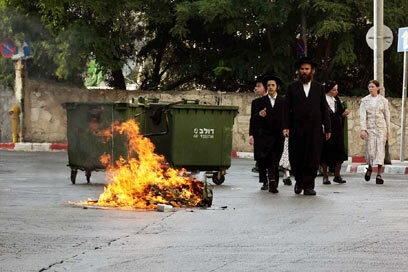 Demonstrators set garbage cans on fire on Shmuel Hanavi, Dvora Hanevia, Hanevi'im and Shivtei Yisrael streets in the capital. Police officers dispatched to the scene closed the streets for traffic and cleared the roads, some of which were reopened a short while later. A court ordered that Weisfish remain in custody until Thursday. He was arrested about a month ago. Haredim recently distributed pashkevilim (informative ads or posters often plastered in the Jerusalem's religious neighborhoods) against stores selling MP4 devices, saying "a terrible plague is upon us, claiming victims every day… these sinful devices were banned by all the great rabbis, but are still common in the haredi world… their devilish distributors want nothing more than to drive the people of Israel to sin through movies and other abominations. "This little device is the devil's way to try and gain entrance to our protected homes and yeshivas, disguised as something you can listen to Torah lessons through," read the ads. Haredim hold demonstrations every evening opposite a store selling MP4 players at Shabbat Square, and also arrive unexpectedly at haredi neighborhoods, where they torch garbage cans, block streets and flee the scene before police arrive. Another pashkevil distributed within the haredi community last week read, "The zionazi police arrested yeshiva student Shmuel Weisfish for his alleged participation in activity aimed against those who pollute our camp, such as the stores that sell profanity. The safeguarding of the Torah is considered a crime in this country of Sodom and Gomorrha. The haredi sect will fight back against its accusers." However, a source in the Orthodox Court of Justice told Ynet that the haredi public "opposes the attacks on the store and is against the riots carried out by the extremists." According to him, the Jewish extremists are looking to "ban films altogether so everyone will study Torah, but some community members want to listen to a song or watch a movie. The extremists do not understand this." The source further claimed that the extremists' actions are undermining the Orthodox rabbis' authority. See all talkbacks "Jerusalem: Orthodox riot in protest of chastity squad arrest"